So, off I went to HuffPost to get my knowledge on. What we have here, I've determined, is a crumble. 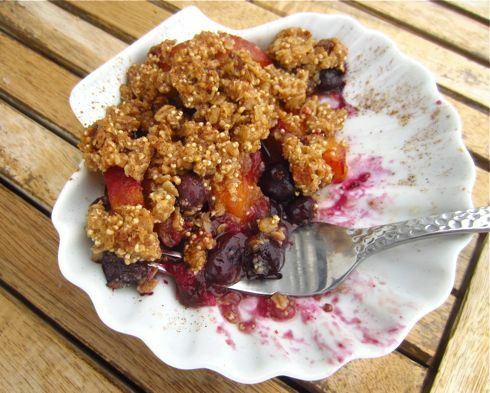 Crumbles, crisps, and cobblers all start with a base of sweetened, baked fruit. But it's crumbles that are topped with an oat-based streusel. Just so happens this crumble's topping is MADE of oatmeal, so this guy's a Crumble with a capital C.
It's one of my mom's old tricks to mix a packet of instant oatmeal into any fruit crumble topping. SO brilliant since those packets are already loaded with oats, sweetener, and spices/flavorings. I took it a step further by cutting out the flour altogether and using packets of gluten free oatmeal for the entire topping base - specifically, Eco Planet Instant Hot Cereal (which I've already pledged my devotion to here). You can absolutely use your favorite kind of gluten free oatmeal, but I happen to like this one since it's flecked with quinoa, amaranth, buckwheat, and lots of other good-for-you grain-type things. Oh - and I also made them mini. Because, it's an obvious truth that mini things taste better. -Use your favorite brand/flavor of instant gluten free oatmeal! I used Eco Planet Instant Hot Cereal, Apples & Cinnamon flavor, and honestly couldn't detect a hint of apple in the final dessert. So don't stress over the flavor too much. -You'll need about 3-4 total cups of fruit to serve 4 people. 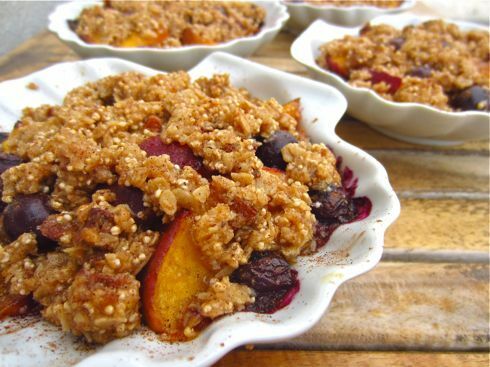 I used nectarines and blueberries, but feel free to substitute other stone fruits and berries! Peaches and raspberries or plums and blackberries would be great. -The Minute Tapioca ratio in this recipe is about .5 tablespoons per cup of fruit. You could use cornstarch as a thickener, but I don't know the exact ratio. Preheat oven to 350 degrees. Spray 4 individual serving dishes with cooking spray. You can use ramekins, mugs, or small bowls. Just make sure they're oven-proof up to 350! Add sliced nectarines and blueberries to a bowl (see notes for other suggestions). Toss with the instant tapioca and brown sugar until evenly coated. (Adjust amount of sugar based on the natural sweetness of the fruit.) Allow the fruit mixture to sit in the bowl while you prepare the topping. 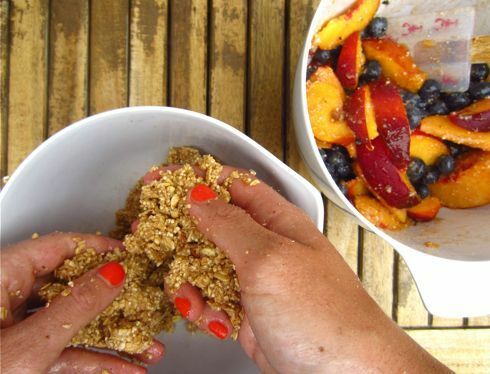 To a small bowl, add both packets of oatmeal, the brown sugar, and the butter. Using your hands, combine the ingredients until it resembles the texture of wet sand. 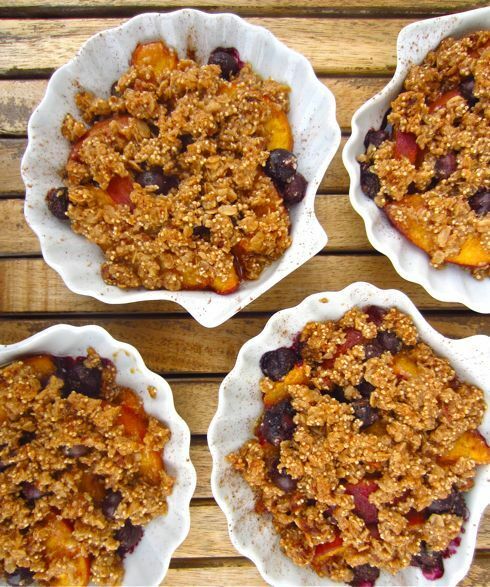 Assemble the crumbles by dividing the fruit filling among the individual serving dishes. Do the same with the topping. Cover the dishes with foil and bake, covered, for 25 minutes until fruit is soft and bubbly. Remove the foil and bake, uncovered, for an additional 10 minutes until the topping is golden brown. Dust the crumbles with cinnamon and/or powdered sugar, and enjoy! hahhah just giggled-out-loud at the picture on the 'gluten free' page of your blog. I was just in Rome a few weeks ago - only for 1 day, but had some great GF pasta! have TOTALLY made that sad face before though. ugh. will keep posting just for you, gal. thanks for commenting!